We’re excited and proud to present Israel’s first startup map dedicated to the Smart City sector.This map offers an encompassing look at technology-based Israeli solutions to the urban challenges, and is a natural next step in presenting and supporting the Israeli Smart City technologies that have been gaining interest all over the world. The map includes 124 startups, divided into 5 major categories: City Transportation, Infrastructure and Environment, City Services, City Management and Sharing Economy. With the understanding that most technological solutions, from banking to autonomous cars, operate within the city – where most human activity takes place nowadays – the question of defining “Smart City” tech arose. How can we draw the line between municipal technologies and those technologies happening within the city borders but not inherently “municipal”? 1.The startup is developing a technological product. 2.The startup’s business model is city - or community-oriented, e.g. a local coin. OR, the startup’s clients are individuals, but its product interacts with the municipal service, e.g. parking. 3.The product operates mainly in public areas or city-owned properties. 4.The product helps to improve citizens’ wellbeing or satisfaction as city residents. For example, a smart banking system improves peoples’ satisfaction as individuals and not residents, and therefore will not appear on the map. Startups must answer the criteria 1 and 2, and either 3 or 4 in order to appear on the map. If you think your startup is missing from the Israeli Smart City Map, go ahead and let us know HERE. CREATORS GovTech Innovation Lab supports governments and municipalities in adopting innovation practices and in converting their challenges into technological solutions. We help them become an active part of the innovation ecosystem, fostering valuable cross-fertilization and accelerating their digital transformation. CityZoom is an urban innovation community, founded by the Ministries of Economy, Interior and the Digital Israel initiative at the Ministry for Social Equality. 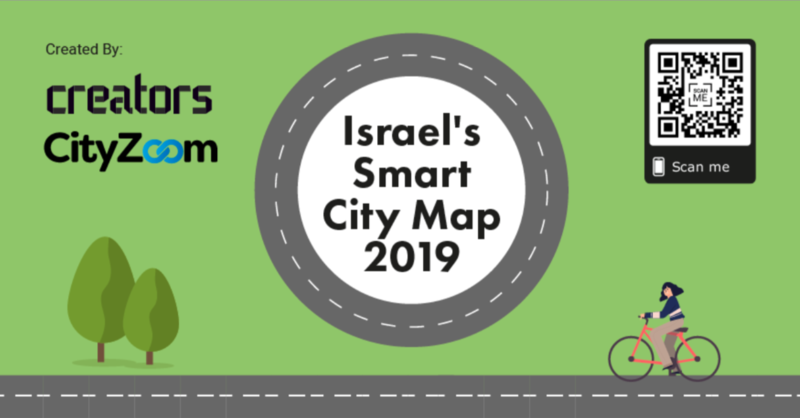 The community is operated by the Peres Centerfor Peace and Innovation, Atidim Park and Tel Aviv University and is focused on connecting cities to technology solutions in order to create smarter cities in Israel and beyond.